Tailored and trim, the Elite 12 ft Shuffleboard is the game room's next addition. The Elite is designed with routered wood panels and a 2.5 inch playfield made from North American grown poplar. The play surface is sealed with 1/4 inch poured polymer resin for a long lasting durability and lightening quick play. The Elite Shuffleboard's glide-out Perfect Drawer stores all your shuffleboard accessories conveniently under the table. 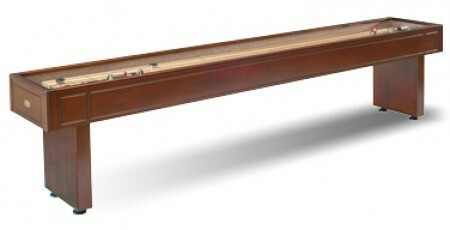 Legacy Shuffleboard playfields have a lifetime warranty. Legacy recommends purchasing the optional light kit for two overhead lights and the electronic score unit to complete your shuffleboard experience.